INDEPENDENCE, Mo. — Residents of Independence say they're getting mixed messages about the city's cold weather rule regarding electricity shut offs. 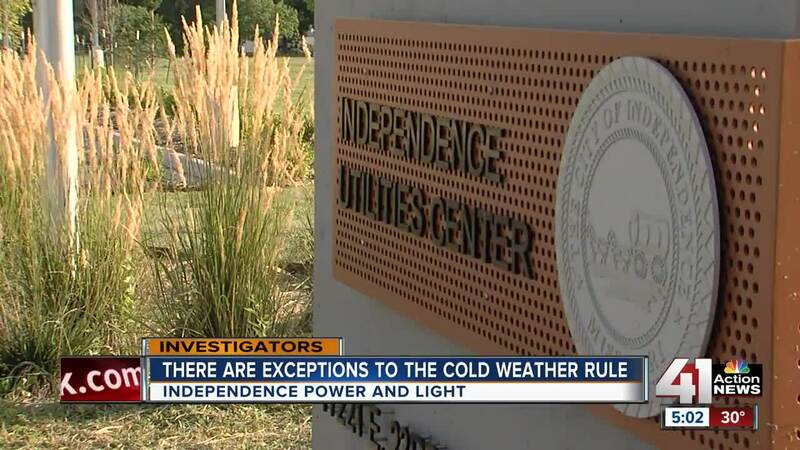 As part of a city ordinance, Independence Power & Light cannot cut off a customer's electricity if temperatures are forecasted to fall below 32 degrees within the following 24 hours. However, after 41 Action News shared this information with viewers Wednesday several residents reported that in calls placed to IPL, staff informed them there's no such rule. Julianne Barrera said she spoke with IPL Wednesday about the weather rule. "I was told over the phone from a representative that there isn't [a cold weather rule] and my power will be shut off regardless of temperatures," Barrera said. "I've spoken to a lot of people and they were told the same thing." The 41 Action News investigators contacted Zach Walker, city manager of Independence, about the claims that IPL staff was not honoring the rule. Walker said phone calls between customers and IPL are recorded. "Any citizen who believes they heard that should report that to us so we can review the phone call and address any potential deficiencies," Walker said. Customers who enter into a payment plan and fail to pay as promised can have their electricity shut off regardless of the weather. Electricity can also be cut off no matter how cold it gets for things like writing bad checks, credit card chargebacks, safety issues, diversion and tampering. Walker said a customer's water utility can also be shut off regardless of weather.